“it was the best of times, it was the worst of times”… 喂等等~! 先別向我擲雞蛋蕃茄, 這出自 “雙城記” 的名句套在 Sonic Youth 的 “Dirty” 身上, 至少比用在特區財政預算案中來得更貼切吧? 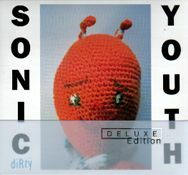 Sonic Youth 在 “Dirty” 中之所謂變革, 是他們採取了前所未有的妥協態度, 因此這唱片可說是他們最易入口, 最親民的大碟~ 這唱片一方面吸納了一批新的 Sonic Youth 支持者, 但另一方面卻被忠實 fans 們狠評為 “向主流市場低頭” 的可恥行徑~ 今天, Sonic Youth 把這張唱片作為 reissue 系列的頭炮 (他們稍後會把90年的 “Goo” 與88年的 “Daydream Nation” 以豪華版再發行), 相信不少人都會感到奇怪, 畢竟最為樂迷津津樂道的 Sonic Youth 之音, 是他們較粗糙豪放的噪音攻勢吧? 對於 Sonic Youth 以大贈送形式再度發行他們的經典大碟, 作為樂迷我自然絕對支持, 只是面對早前買下來的 original copy 時難免有點不好意思~ 現放在唱片架上的 “Daydream Nation” 恐怕也快要被稍後的 reissue 版取代吧?